North American stocks slid across the board on Tuesday after comments by the new Federal Reserve Chairman Jerome Powell on the strength of the U.S. economy pushed bond yields higher. During his first speech in front of lawmakers in Washington D.C., Powell said that it was his personal view that the U.S. economy had strengthened since December and he saw inflation heading towards the central bank's two per cent target. 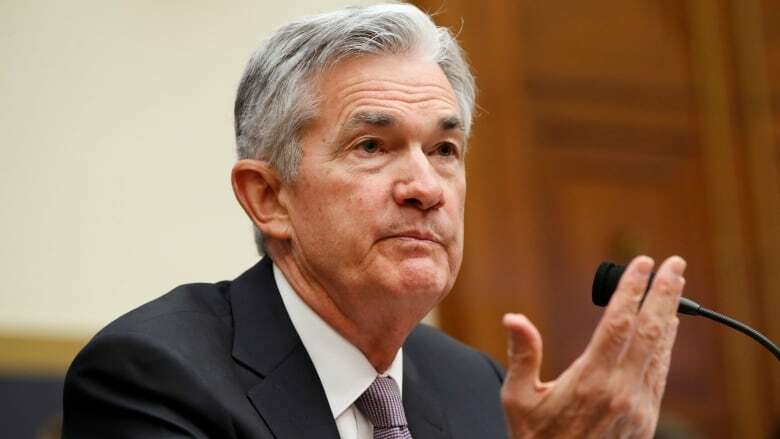 "I think each of us is going to be taking the developments since the December meeting into account and writing down our new rate paths as we go into the March meeting and I wouldn't want to pre-judge that," said Powell during the question and answer period after his prepared speech. On Wall Street, the Dow Jones industrial average closed down 1.2 per cent or almost 300 points to 25,410, while the broader S&P 500 index lost 1.3 per cent to 2,744. The tech-heavy Nasdaq composite was lower by 1.2 per cent to 7,330 points. Investors had been awaiting Powell's comments for direction in the equity markets that had somewhat stabilized after volatility that started last month drove benchmark indexes into correction territory. The CBOE Volatility index, better known as the VIX — which is considered the best gauge of expected volatility on Wall Street — jumped to 18.79 points, marking its biggest gain in over two weeks. The yield on the benchmark 10-year Treasury note rose to 2.89 per cent. The bond is considered to be the global driver of borrowing costs. Analysts at Capital Economics said the Fed is tightening policy "in earnest" and they think six rate hikes are likely by mid-2019. "With the economy set to receive an additional fiscal boost following the recent deal in Congress to raise the discretionary spending caps, we are revising up our GDP growth forecasts for both this year and next," the research firm said in a note. Meanwhile, Ranko Berich, head analyst at commercial foreign exchange specialist Monex Canada, said Powell didn't give suggestion of a fundamental change in the Fed's approach to its policy, but his "overall optimism and willingness to acknowledge near term upside risk was enough to give the dollar a boost and hit treasuries." "Markets appear to finally be waking up to upside risk to the Fed's policy path in the near term, although it remains unlikely we will see more than another three or four hikes this year unless wages and inflation accelerate dramatically." In Toronto, the S&P/TSX composite index followed its American counterparts lower to lose 0.3 per cent to 15,671 points. Some of the biggest drags on the index were the country's biggest medical marijuana producers, whose shares have been declining from their peak in January. Shares of Canopy Growth fell over three per cent, while Aphria lost 3.3 per cent. The Canadian dollar, meanwhile, traded at average of 78.49 cents US, down from Monday's average price of 78.83 cents US. The dollar index, which measures the greenback against a basket of major currencies, hit a three week high after Powell was upbeat about the U.S. economy.